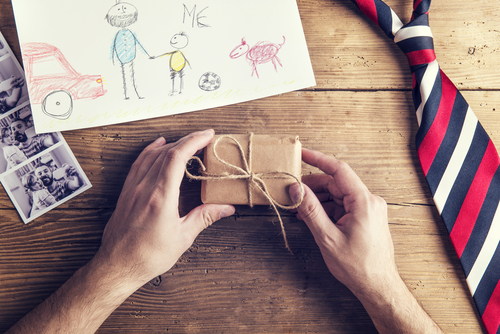 When it comes to gifts for a dad, one size does not fit all. To find the perfect present, you need to consider his interests and the kind of relationship you have with him. Instead of getting him something generic, like a tie, he’ll be touched by your thoughtfulness and grateful for a gift he actually loves. For the dad who is always looking to the next-best thing in tech, the Amazon Fire TV is a sure to be a hit. It makes accessing Netflix, Amazon Instant Video and HBO GO easier than ever, and it has the latest functionalities, such as voice search, apps and games. You may even find yourself visiting more often, too. Chances are that a classic dad already has a watch, but this doesn’t mean he can’t use an update. The award-winning Timex Button Stud Weekender is the perfect combination of modernity and tradition, with a streamlined look and no bells and whistles. It can be hard to find, so grab one for your dad at Form Function Form. Tickets to a show or experience you can share is the perfect option for an artsy dad. If you aren’t sure what show your dad will really love, you can purchase gift cards from $25 to $500 from Telecharge that are redeemable for various theater tickets. It can be difficult to spend time with your parents when you are an adult with your own family and responsibilities, so planning a camping trip with him is a great way to spend some time together. Purchase some of the necessary equipment, reserve a campsite and present him with an itinerary for your trip. If you have children of your own, include them in the trip and help them learn about something their grandpa loves. If he would love to wear his favourite book across his chest, look no further than Out of Print. This company offers an array of printed tees, sweatshirts, tote bags, pencil pouches and notebooks with classic book covers. Or, if he would enjoy a physical book more, AbeBooks is a great resource for hunting down the first edition of his favourite title. For a dad who wants nothing more than a home that smells of old books, Frostbeard Studio offers an old books scented candle that will delight your bookworm dad. Is your dog the favourite child in your family? If so, he will love a custom pet portrait. Sites like Etsy have tons of options for a one-of-a-kind gift that he will cherish for years to come. While it may seem unimaginative, when all else fails, a good old gift card will let him pick something he really loves. Make sure it’s to a store you know he shops at, or consider giving him an Amazon gift card. If he’s Internet-savvy, he’s sure to find something he wants or needs. Previous story Honor 6 to get Android 5.1 and EMUI 3.1!